You may have seen a video of an adorable corgi taking his first swim. In a red life jacket, the pup watches on apprehensively as his sibling majestically dives into the water—and with a small pause, follows him in. His second attempt is more noteworthy; he dithers cautiously at the edge of the platform, tip-toeing about as if contemplating his decision to pick up a buoyant ball in the lake. Then he leaped, and it is the most magnificent leap in the history of corgi-kind: stretching his legs to give himself more propulsion, he then tried to push himself even further mid-air by wriggling his front limbs ever so slightly. He landed in a belly flop, with the trooper triumphantly retrieving the ball for his owner. This trepidation of jumping—and wildly hoping for a safe landing—is pretty much the essence of platformers. We waffle a little, and then take a leap of faith from one scaffolding to the next, and perhaps over a deadly pit of lava and spikes. But while jumping remains our primary means of navigating the world of platformers, these indie titles reinvigorate the classic platformer formula in new ways, as they explore our tenuous dependence on spaces and visibility. The ability to scout ahead, and know what you’re flinging your avatar towards, is usually an indispensable feature in platformers. But what if you can manipulate their spaces by adjusting the size of the window that houses these games? This main conceit in Windowframe challenges players to scale its environment beyond just vaulting from one platform to the next. Your peripheral vision within the game only extends to the size of your browser, which can be adjusted when you toss a pin at its edges. These staked edges also become walls you can climb, letting you access typically inaccessible places and exits when jumping between walls. Having to manage a new element in a platformer—space—forces you to think out of the box—and consider the crucial relationship between platformers and its spaces. Check out Windowframe on itch.io. The feeling that claw machines are somehow inexplicably rigged against us had been confirmed by an arcade operator years ago, deepening our animosity against these damned arcade machines. Luckily, the same claw in Claw Quandary is a lot less fickle, its iron-clad grip used to transport blocks and other obstacles away from our prize: a cuddly teddy bear. Having been mysteriously transplanted into a claw machine, our relentless protagonist uses the claw to help her collect all the teddies, but even that still has its limits; you’ll need to insert coins into the machine to operate it. The result is a challenging and engaging platformer that pits your skills against its myriad puzzles, forcing you to make strategic, rather than well-timed leaps, towards the coveted price, while you assess and maneuver your surroundings. In fact, it’s the very antithesis of a real-life claw machine. Download Crane Quandary on its itch.io page. The monomythic journey of videogame heroes isn’t all that new, especially for the platformer genre. Luminous stands out with its allusions to mental health and how that moulds his surroundings, which becomes less visible as his conviction wanes. Keith is The Chosen One—a knight tasked to rekindle a light that once permeates a previously bustling town, which is now a gloomy, dilapidated city inhabited by ghastly figures. Making the experience more dispiriting is his cynical guardian, who chastises him whenever he fails his quests. Moreover, while Keith may tap on an innate power that imbues him with superhuman dexterity and injects scenes with a chromatic shine, doing so will sap his energy and shrink his radius of light, which obfuscates the map. These metaphors for depression are so overt they’re nigh impossible to overlook. Luminous is a particularly punishing platformer that demands perfection from its players, but I suspect its larger goal is to reveal the ostensible hopelessness that those with depression often experience. There’s much value in this revelation, but I do wish there’s a way to convey that they don’t have to go through these pains alone. 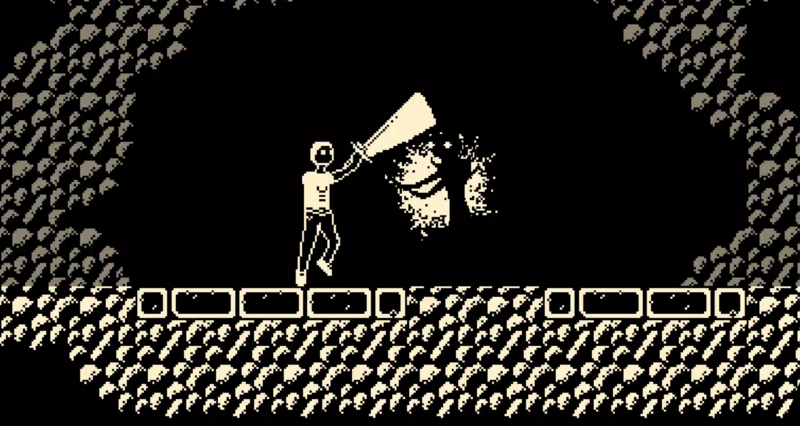 Experience Melancholia In Just Two Minutes The Domestic Horror of Perfectly Ordinary Ghosts Minimalism and Collage in Minit Bork in the U.S.S.R.